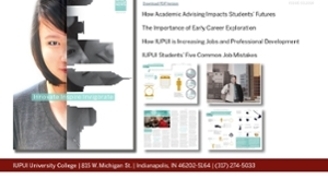 Indianapolis, IN (November 2016) – The Offices of Development, Operations, and External Affairs in the Division of Undergraduate Education (DUE) won the gold award from MarCom Awards for their promotional materials for the 2015 National Mentoring Symposium. The offices have a history of winning awards from MarCom Awards for the division. In 2014 alone, they won five awards. Issues 1.1 and 1.4 of the DUE News received honorable mention, while issues 1.2 and 1.3 won platinum and gold respectively. In addition, the division’s spring awards convocation program received honorable mention in the brochure/special events category. MarCom Awards is a “creative competition for any individual or company involved in the concept, writing and design of print, visual, audio and web materials and programs.” It is highly competitive with about 6,000 entries per year, “perhaps the largest [promotional competition] of its kind in the world.” It is because of its scope and the quality of competition entries that the division is so proud of its many awards.